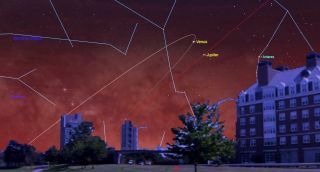 When very bright Venus rises from the southeastern horizon at around 4:30 a.m. local time on Tuesday, January 22, the planet Jupiter will be positioned only 2.5 degrees to Venus' lower right. They will both fit within the field of view of binoculars (orange circle). Both Jupiter and Venus will be travelling eastward during the third week of January, but Venus' faster motion will cause it to catch, and then overtake, the more distant planet, pairing them up for several mornings on either side of January 22. Without a doubt, now that Sunday night's total lunar eclipse has passed into history, the most spectacular celestial sight coming this week is reserved for the early morning sky: Venus and Jupiter, the two brightest planets, will unite for a stunning dawn conjunction. For the past few months, dazzling Venus has been prominent in our morning sky. And about a month ago, brilliant Jupiter also began to emerge from the glare of the sun. The two planets are currently rising from the east-southeast horizon more than 3 hours before sunrise. All through this month, the gap between them has been noticeably closing. Jupiter has been slowly ascending and approaching Venus, and on Tuesday, they'll be separated by 2.4 degrees, which is equal to nearly five times the apparent width of the full moon. (The width of your fist, held at arm's length, roughly corresponds to 10 degrees.) Jupiter will shine brilliantly, at magnitude -1.8, yet it will appear only one-eleventh as bright as Venus, which will gleam at magnitude -4.4 (lower magnitudes are brighter). Together, the two objects will make for a spectacular "double planet" in the dawn twilight. In recent days, I've received several inquiries from early risers who have sighted these two bright lights in the east-southeast sky and have wondered what they are. Of course, what we are seeing is strictly an illusion of perspective. In a relative sense, neither planet is close to the other in space. Venus is 73 million miles (118 million kilometers) from Earth. The lesser gem flanking Venus — Jupiter, largest of all our solar system's planets — is nearly four and a half times more distant from us than Venus is, at 558 million miles (897 million km) away from Earth. Generally speaking, at least for the immediate future, conjunctions between Venus and Jupiter will come in pairs. The first conjunction such a pairing takes place in the morning sky, followed about 10 months later by another in the evening sky. Then, after about two and a half years, Venus and Jupiter will again appear in conjunction, again in the morning sky. After Tuesday's conjunction, Venus and Jupiter will next get together in the evening sky late next fall, on Nov. 24. After that, we'll have to wait until April 20, 2022 (morning sky) and March 2, 2023 (evening sky) for the next set of Venus-Jupiter conjunctions. Editor's note: If you snap an amazing photo of the Jan. 22 conjunction of Venus and Jupiter that you'd like to share with Space.com and our news partners for a possible story or image gallery, send comments and images in to: spacephotos@space.com.